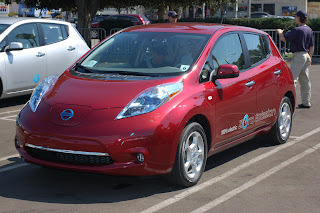 Home » Nissan » Nissan faces delays for Leaf electric car in U.S.
Nissan faces delays for Leaf electric car in U.S.
Nissan Motor Co has had some delays in delivering its Leaf electric automobile to U.S. customers, the Financial Times reported on its website on Sunday. Nissan and its partner Renault SA, formally launched the zero emissions Leaf vehicle in December. Nissan acknowledged bottlenecks in its quality assurance procedures and distribution delays because of the Leaf's Internet-based ordering system, which bypasses U.S. dealers, the Financial Times reported, citing Nissan's U.S. spokesman David Reuter. Nissan expects the congestion to ease by April but said production was on schedule, the Financial Times reported. Nissan and Renault have earmarked $5 billion over the next few years to mass-produce electric vehicles and the batteries that power them.